Instructions for crocheting this cute purse come from the February 1971 issue of The Workbasket. 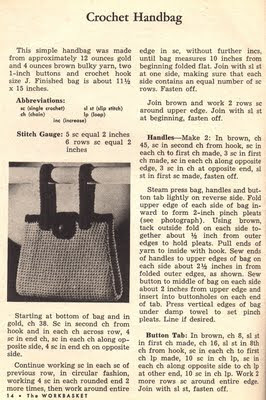 If you ever find a pattern for making a real backpack, not one of those lightweight types meant to be a purse, but a real backpack. I've been looking for something like that for ages. Crochet or something I can sew from leftover denim jeans.